Rhode Island natives Jan and Earl Travers help support their local seniors and adults with disabilities through a monthly small act of kindness. Each customer receives one monthly supply of groceries to their home with the help of Southern Rhode Island Volunteers’ volunteers. Program participants either can't drive to the food pantry or don't have a friend, relative or caretaker to drive them. The Travers deliver donated bags of groceries from the Jonnycake Center of Peace Dale one Friday a month to 13 residents who can't easily access the resources to supplement a healthy diet. Through this program, a total of 51 Wakefield area residents are supported by their Rhode Island neighbors in their wish to age and live independently in their homes. For RSVP volunteer Jan, giving back was always embedded in her being. From a young age Jan was taught the value of volunteering through her local church and joined the Masonic service organization the Rainbow Girls. In 2012, Jan joined Southern Rhode Island Volunteers delivering Jonnycake groceries with a fellow churchgoer at the Wakefield Baptist Church. “When you’re going out and volunteering you may think that you're feeling bad but then you might see someone else and say, ‘Gee I’m doing okay,’” Jan said comparing her own fortunes in life to those who aren’t as fortunate. Her husband of 45 years, Earl, balanced two jobs for most of his life, so he was only able to start volunteering in 2013 after he retired from his 43 year tenure at the University of Rhode Island working in the Controller’s Office. Conveniently, this was during the time Jan delivered the groceries with a church friend. One day, Earl decided to tag along as the third wheel and help carry the food bags to the residents. Earl quickly realized the joy volunteering brought into his life. Shortly after he started, Earl became the permanent delivery partner alongside his wife when Jan's church friend took a job with the church. Jan and Earl live with their two adopted dogs in Narragansett. They have been married for 45 years and have four children. 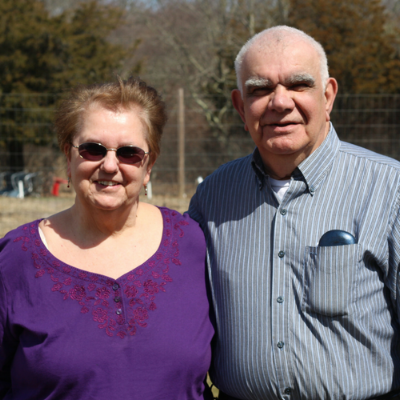 Aside from volunteering and being involved with their local churches, the couple frequently heads up north to their second home in New Hampshire. Volunteering for Earl has become a pleasant ritual, where he chats with the residents at each stop and does a quick wellness check to ensure the residents are doing okay and being treated fairly. For Jan the best thing about volunteering is just giving back, which is why she has always been involved with helping her community. For those interested in volunteering, but don’t know if it’s right for them, Earl and Jan suggest to just get out there and do it. Earl suggests shadowing an experienced volunteer to see if the opportunity is a good fit just like he did. Jan adds that it's a good way for a skeptical volunteer to talk with someone who really enjoys what they're doing and ask questions. **Jan and Earl are part of SRIV's Retired Senior Volunteer Program. To learn more about the RSVP program click here.